Jillian is an average 12-year-old helping her potential stepfather propose when she’s kidnapped and held in a facility for genetically-altered kids. As she learns about her biological family, Jillian discovers that she has a brother who desperately needs her help. Her captors have no intention of letting her go so Jillian must find a way to do what needs to be done. The author, Julie Gilbert, gave me a copy of this book in exchange for my review. Ashlynn’s Dreams (Devya’s Children Book 1) is Judy Blume meets Orphan Black. Jillian is an average kid who is extremely precocious. She’s clearly been indulged and is happy and confident and is concerned with results instead of planning. Jillian kind of runs like an overwound toy at first, happily coming off quite a bit younger than her stated age, but not unrealistically so. Ashlynn’s Dreams (Devya’s Children Book 1) is a story told to a therapist in the look-back format of diaries and notes from Jillian and her fellow kidnap victim, her babysitter, Danielle. While the format may at first strike as a reader as somewhat awkward, Gilbert writes many of the entries with more life than many author’s write interactive narrative. She imbues the people on the page with charm and vitality which leaves readers young and old with no doubt of the evolution of the characters due to the stress put upon them by their extraordinary situation and, for Jillian, the weight of everything she thought she knew turning out not to be true. There are a lot of characters in Ashlynn’s Dreams (Devya’s Children Book 1) which could become quite confusing. Gilbert helpfully offers a listing of those characters at the start of the novel. Jillian and Ashlynn are the same person. 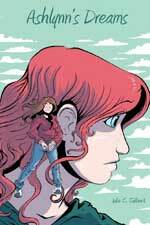 Jillian has an ability to insert herself into dreams, and at first it’s a task. Eventually she learns how it can work to her advantage allowing her to eavesdrop on the subconscious Life is the lab is not happy for Jillian and Danielle. Jillian’s diaries are progressively less airy and more introspective as her spirit is crushed under the weight of her situation with her captors keeping Jillian in line with the abuse of Danielle. Their goal is testing and experimentation. Jillian is a lab animal and that’s made quite clear. This could be quite a heavy concept for kids except that Gilbert keeps the narrative on a human level. With time the character starts to look at her ability in a philosophical sense. Dream trolling isn’t something she can do, it’s something she does do whether for her own gain or for that of the people looking to her for results. Heady material for a young audience and food for thought. Jillian’s ability to enter the dreams of people was a device that really intrigued my 12-year-old Alex. With time Jillian finds new abilities and is able to expand her repertoire. Alex found Jillian’s written regional dialect authentic and the idea behind the novel intriguing. Alex does not watch shows like “Orphan Black” but has shown an interest in doing so and Ashlynn’s Dreams (Devya’s Children Book 1) is a perfect entry to the genre. It is a story with heart, soul, spirit and substance and readers will fall in love with the style of writing while their heart breaks for young Jillian and her loss of innocence. Ashlynn’s Dreams (Devya’s Children Book 1) is beautifully plotted and expertly written. Alex and I both really enjoyed the story and both thought the ending left a door open for a sequel that we really hope Gilbert writes. While marketed for children, I think Ashlynn’s Dreams (Devya’s Children Book 1) holds a wide appeal. It is a wholly unique story written with an authentic and engaging voice and the complexity is suitable for fans of any level of literature. If your 12+ child has been asking to watch the shows on SyFy, pick Ashlynn’s Dreams (Devya’s Children Book 1) up for them. Julie Gilbert is a New Jersey based author who has worked as high school science and chemistry teacher. She is the author of a number of children’s novels. Ashlynn’s Dreams (Devya’s Children Book 1) is the first novel in the Devya’s Children series. For more information about Julie Gilbert and her visit her website. You can connect with her on Goodreads, Facebook and Twitter @authorgilbert.